James Beard Outstanding Restaurateur semifinalist Mark Stark is the executive chef and co-owner, with his wife Terri, of five wildly successful restaurants in Sonoma County: Bird & The Bottle, Stark’s Steak & Seafood, and Monti’s in Santa Rosa, and Willi’s Seafood and Bravas Bar de Tapas in Healdsburg. Their flagship restaurant, Willi’s Wine Bar, was lost in the Tubbs Fire of 2017. The Starks have two new restaurant projects in the works in Santa Rosa for 2019: the much-anticipated re-opening of Willi’s Wine Bar in its new location at the Town & Country Shopping Center, and Grossman’s Jewish Noshery, a “Jew-ish” -style deli and beer garden in the Hotel Santa Rosa in Historic Railroad Square. 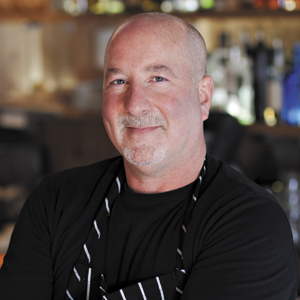 Mark is a graduate of the Culinary Institute of America in Hyde Park, New York and honed his professional cooking skills in Washington DC and Seattle before settling in Sonoma County. He’s appeared in the PBS series Traveling Feast with Fine Cooking and KQED’s Check Please! His inventive menus highlight a global melding of flavors with Asian, Mediterranean, French, Spanish and Californian influences. From opening Willi’s Wine Bar in 2002 to Bird & The Bottle in 2015, Mark and Terri’s restaurants have consistently earned top accolades and praise including San Francisco Chronicle Top 100 Bay Area Restaurant status for Willi’s Wine Bar and Bravas, and Michelin Bib Gourmand awards for Monti’s, Bravas, and Willi’s Wine Bar.